We start from parking of Confins (Clusaz) and via Chalet de Pacally and Combe De Tardevant climb at summit. Elevation gain: 1050m. Length: 13 km. This hike has no technical difficulties, but some small steep slopes. We meet at Veyrier Douane, final stop of bus n° 8, at 7:30. Inscription is obligatory. 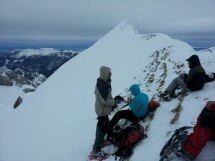 Equipment: Good mountain shoes, picnic, drink, hat, gloves, gaiters, snowshoes, warm and waterproof clothes. All participants must be well-prepared and have all equipment with them.